Theresa May has insisted it is the UK’s national interest at stake over Brexit, not her own “personal fortunes”. The prime minister told the Sun that ending the deadlock in the negotiations was “not about her” but about ensuring the best possible deal for the country. She will update the Commons later amid renewed talk of Tory MPs forcing a confidence vote in her leadership. The BBC’s Laura Kuenssberg said there was “deep unhappiness” about the PM’s handling of the process. The prime minister will tell MPs that 95% of the withdrawal agreement setting out the legal terms of the UK’s departure has now been settled. But she will acknowledge the issue of how to deal with the border between Northern Ireland and the Republic of Ireland is continuing to stand in the way of a deal. Many Conservative MPs are unhappy about plans floated at last week’s EU summit for the transition period after the UK leaves next March to be extended beyond the end of 2020. Both Brexiteers and Remainers worry it would delay further the moment of the UK’s proper departure from the EU, and potentially cost billions in terms of extra payments. 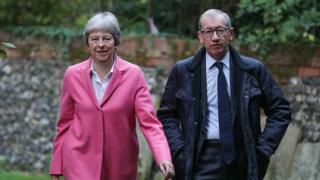 The PM has not ruled out the idea, which its backers say would give the two sides more time to agree their future economic partnership and ensure that controversial contingency plans to avoid a hard border on the island of Ireland, the so-called backstop, do not ever come into force. Transport Secretary Chris Grayling told the BBC he would be happy to contemplate a “short bridge” between the end of the transition period and the start of a new UK-EU partnership. But he said it would be unacceptable for the UK to be stuck in “limbo” for a prolonged period. Mrs May told the Sun that protecting the UK’s integrity was so important that she had a duty to explore “every possible solution” to keeping the Irish border open and ensuring no new barriers within the UK as a whole. “Does that mean I think this negotiation will get tougher before we reach our goal? Yes.” she wrote. She suggested the talks should not be personalised and her own future was secondary compared to getting a deal which respected the 2016 Brexit vote but also protected jobs. A weekend of feverish speculation suggested Mrs May had 72 hours to save her job ahead of a meeting of the 1922 committee of backbench MPs on Wednesday. One of those who has called for a vote of confidence in the prime minister, backbencher Andrea Jenkyns, said she feared the PM was playing for time. A leadership contest can be triggered either if the leader resigns or if 15% of MPs – that is currently 48 – write to the chair of the 1922 Committee, demanding a vote of no confidence. Former Conservative Party chairman Grant Shapps, who called for a confidence vote a year ago, said he understood colleagues’ frustrations about apparent concessions but believed the time for a new leader before Brexit had passed. In an unusual move, Mrs May spent several hours on Sunday briefing cabinet ministers about what she would say in Parliament later. Mr Grayling dismissed suggestions this was a sign of the sense of crisis in Downing Street and appealed to colleagues dismayed by the direction of negotiations to show “calm heads”. 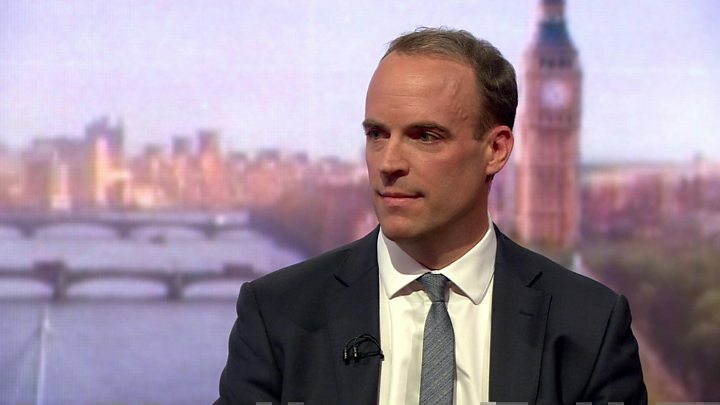 “We have got to get through the last bit of negotiation,” he told BBC Radio 4’s Today programme. The cabinet, he insisted, was united behind the PM in her refusal to sign up to anything which separated Northern Ireland from the rest of the UK. In her statement, Mrs May will cite the agreement reached in the last few weeks on the future of Gibraltar and the UK’s RAF bases in Cyprus as sign of the progress that is being made.